Scott Jepsen is Vice President of External Affairs and Transportation for ConocoPhillips Alaska, Inc. Scott’s specific responsibilities include government relations, community investment, stakeholder engagement, media and advertising and managing ConocoPhillips Alaska’s pipeline interests. Scott has a BS and MS in Chemical Engineering from the University of Texas at Austin. 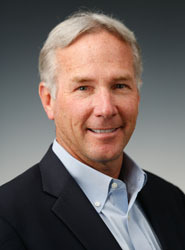 He began his career with ARCO in Denver, Colorado. During his tenure with ARCO and its successor companies, Phillips and ConocoPhillips, Scott managed oil and gas fields in the lower 48, Cook Inlet and the North Slope. Scott first came to Alaska in 1982 and has lived in Alaska for 30 years. He has over 38 years of experience in the domestic oil and gas business. Scott currently is Treasurer for the Resource Development Council and serves as a board member for the University of Alaska Foundation and Commonwealth North.